Content business models are shifting. We know this. But, perhaps the question “into what?” is the more relevant one to ask. In our new book Killing Marketing, my co-author Joe Pulizzi and I discuss how the product business model and the media business model are largely the same these days. The common denominator is the audience, and the content that enables the growth of a trusting, passionate audience. It’s that second and the last two sentences that resonate the most with me, and illustrates the commonalities with today’s business. It is no longer enough for us to simply generate content that brings attention or eyeballs. We must create “fan-centric” businesses. Fans (or audiences) spend more with us, are less likely to churn, and they recruit tomorrow’s fans. And at the core of a fan-centric business is the talent and commitment to an owned media strategy. 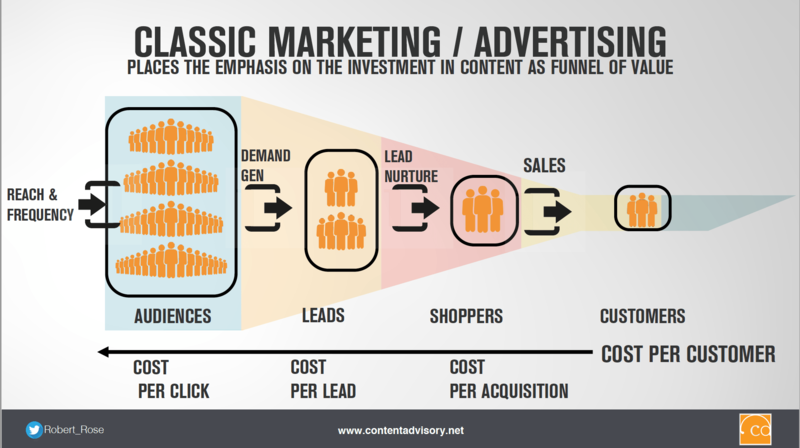 The funnel model is one that we marketers have lived with for as long as I’ve been in marketing (25 years now, but who’s counting). It operates as the below graphic would outline. We use content, through promoted, earned or owned means and we hope to create enough demand that a smaller number of them “enter” our funnel. Then, we nurture them through content and persuasive messaging that an even smaller number become qualified opportunities to buy our product or service. Then, ultimately, an even smaller number turn into customers that purchase our product or service. The key here is that it’s always a diminishing number (hence the funnel shape). We maximize our reach, minimize our frequency (because that represents cost) and the more that we can pull into the funnel (and keep there) creates the marketing efficiency that we’re used to. Then, we assign (and measure) costs/effectiveness at the various stages of the funnel. We examine cost-per-customer, cost-per-acquisition, cost-per-lead and cost-per-visitor. And going out beyond the funnel we measure CPM (cost-per-thousand) for that broader awareness. But measuring an audience is different. In this model, we start with the same effort – to maximize our reach, and minimize our frequency (and measure the cost per acquisition). But the major difference is that our goal is to build an audience, not filter through to customers. We have grouped these together in what we call the Four C’s of Audience Value. But, the critical point is that it maximizes the value of each and every person that we are privileged to reach, and attempts to reverse the shape of the funnel. We are trying to build a bigger and bigger group of people. We are, indeed, building a “fan-centric” business. Once we are sold on the value of the business value of an asset called an audience, it then becomes incumbent on us to provide for a valuation of that audience. Earlier in this post, I said that “we are trying to pull in as many people as are relevant to our purpose.” That is important. When we are building an audience, our purpose is broadened for sure – because we are after more than just immediate “buyers”. However, that doesn’t mean our purpose is any less specific. This becomes the first attribute of the valuation of our audience. If our average cost per acquisition for a new audience member is X, then one assumes that someone that is in our “sweet spot” of acquisition is something greater than X. And we can tier this across our targets – perhaps calling them our A, B, C, & D level audiences. D level audiences might even be a discount against our average cost per acquisition value. Then we can look at other attributes as well. We can look at the age (or maturity or loyalty) of the audience. Did we acquire that subscriber 4 years ago? And we can compare it against engagement. Have they ever clicked, or engaged with anything we’ve sent them? We can also examine their engagement level more broadly. A subscriber who willingly gave us personal data might be called “engaged” and be valued at something more than the average cost per acquisition. However, an addition to the database that comes from scanning a badge at a trade show might simply be average, or even below average value. Finally, we can look at the amount of data we have accumulated on that subscriber. Do we have more than just an email address? Do we have behavioral information? Do we have more explicit demographic information? Do we have poll or survey information? Those data attributes are the elements we use to monetize the audience against the above measurement metrics. Once it’s all pulled together, what emerges is a snapshot of each and every subscriber and their relative value to what it cost to acquire them. And of course it evolves. A subscriber may come into our audience at a below average value, but then through activity, re-targeting and data acquisition, become one of our more valuable audience members. 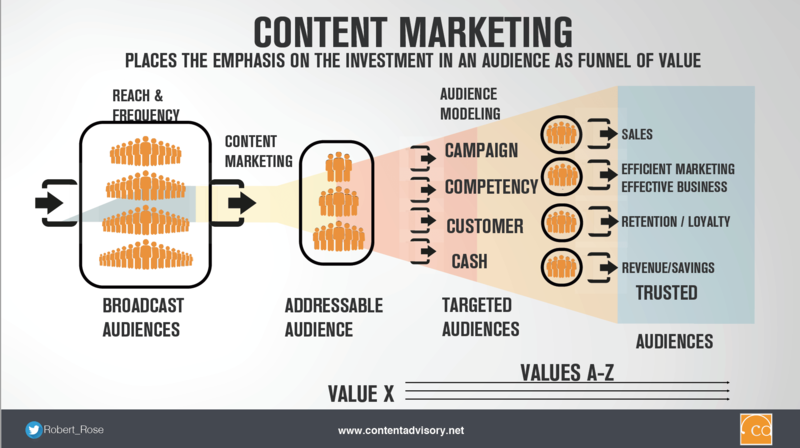 This is where the power of our ongoing content marketing becomes a strategy; one build to increase the value of our asset – the trusted audience. Next week we will look at a new and specific case study on how audiences can be modeled, and how that can affect our content marketing strategy going forward. If you’re interested in having your audience audited, and getting access to our Audience Valuation Engine, please let us know. We’d love to walk you through a demonstration and start looking at the value of your subscribers today. I like the way these articles are building into something interesting here, Robert. What sticks with me from this article is just the massive role of talent in the equation. And it is a leadership talent, a creative talent, and an artistic talent as well as a “marketing” talent in the older sense. You mentioned before how Dan Pink pointed this out some time ago – it looks like this could become a new golden age for a certain type of creative marketer. Thank you so much for a great comment. It’s such a great point as well. The talent is really the only thing that separates a great media company from a brand company and competing in the audience acquisition space. And, I think you’re right – the skill sets for the new creative marketer are absolutely changing.